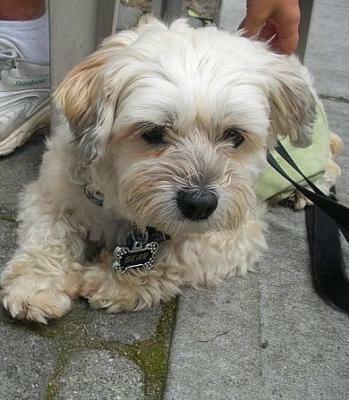 Scout is a mix between a Maltese and a Lhasa Apso. My Lhatese is seven years old and still looks like a puppy. I am still amazed at how small she is - weighing in at around three pounds. I believe that she was some sort of a runt because she was the last puppy left in the litter. No one seemed to want her. But, I got her and she has been a source of unconditional love, companionship and comfort in my life. She loves to sleep, be held for hours, eat turkey bacon and watch The Golden Girls. I love her more than I could love any living creature. Scout was born in a little one-horse town called Pocahontas, Tennessee but soon moved in with me in the big city of Memphis. I will eventually get another Lhatese. I'm sold! Join in and write your own page! It's easy to do. How? Simply click here to return to Tell Us About Your Lhatese!. 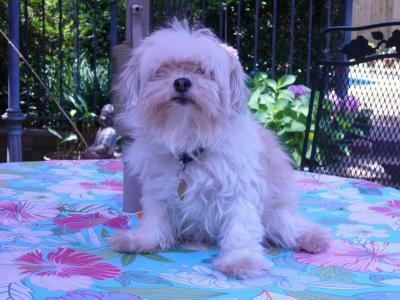 When we got our Lhatese Cassie we knew a lot about the Maltese and the Lhasa. 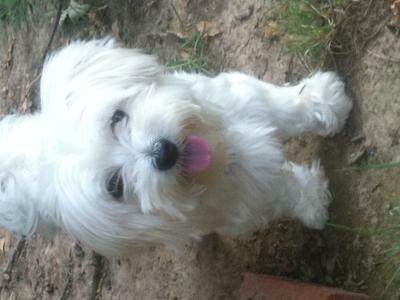 We have a pure Maltese already and my mother has a pure Lhasa. I love the two breeds so much I figured I would love the two mixed together. And I was right!!! Cassie is our little angel! She is even more lovable and precious than I could've even imagined. She has the best temperament and disposition. She goes with the flow, she is always ready to give you more kisses. 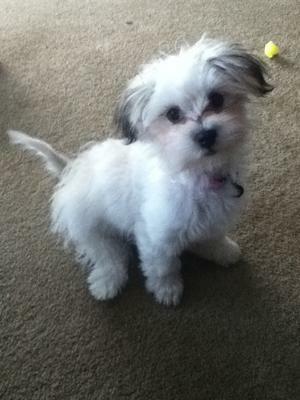 She stayed small, even though her father(which was the Maltese) was a pretty large one. She just has the most beautiful soft smooth coat. Her ears are so little and they are dark. Her eyes are dark but the rest of her body is white with a few tan patches on her back. She is just perfect. I wish I could have another one just like her. About a year ago we tried to contact the people we got her from to see if they had any more puppies on the way, but we could not get in touch with them. Thanks for wanting to know about my sweet baby girl! Two Paws UP! for Cassie! She's sooo adorable, cute, clever, loyal, full of joy and energy. What a cutie pie! I'm looking for another Lhatese, and am having a tough time finding one. Are you aware of any breeders? She is so adorable! She looks so cute and girly. Love her. What an absolutely beautiful little dog! 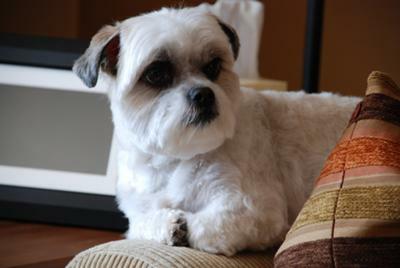 My beautiful highly spirited Lhatese Precious is three quarters Lhasa Apsa and a quarter Maltese. She is almost seven months old. 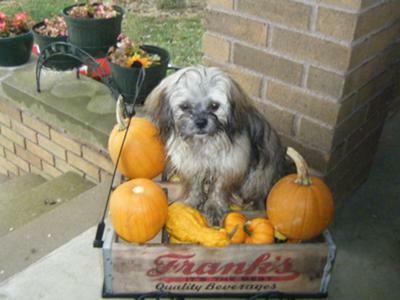 Maggie is a Lhasa Apso Maltese mix. She is cat-like in the way she likes to grip and cling with her front legs. She'll hold on to my arm so tight I can lift her up. She loves the water and will swim to fetch a stick. She loves to play with big tall dogs and is even happier if they run while she chases them. If they get rough, she rolls under them and nips their ankles. She definitely needs a lot of exercise. She's also a shaggy little mop. Maggie reminds me of my lhatese Bumper;they are almost identical. I hope you have many happy years with her, just like I have with my two (Tilly). They are both now almost 16, brother and sister from the same litter. It saddens me when i think of their age and how much longer we have with them; hopefully a good while yet. Maggie is adorable. Many years of love to you both. THE BEST DOG I HAD WAS A POODLE,TERRIOR AND LASO APSO. I AM SURE YOU WILL HAVE MANY WONDERFUL YEARS WITH THIS SWEETIE. What a little darling wee Maggie has turned out to be. As her "grandma', I can tell you from experience she's a little cannonball - goes everywhere fast and leaves a trail of destruction behind her - nothing naughty, just loves to bring in a stick or leaves to chew up on the floor! A joy to babysit from time to time, she's gone to the most perfect home (as have all the litter), and gets plenty of exercise - as opposed to others in the litter that happily sleep all day! 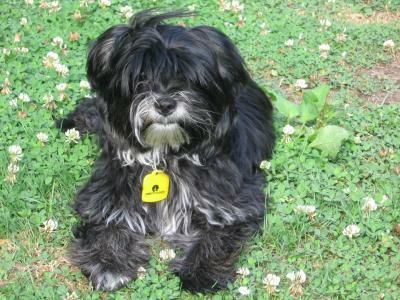 I love shaggy dogs. She looks sooo adorable! My Lhatese is really lazy and spoiled. Doesn't like to be outside only to go to the bathroom. Has never bit anyone or attacked anyone. Always very calm is old and doesn't pay attention he also gives a lot of attitude. 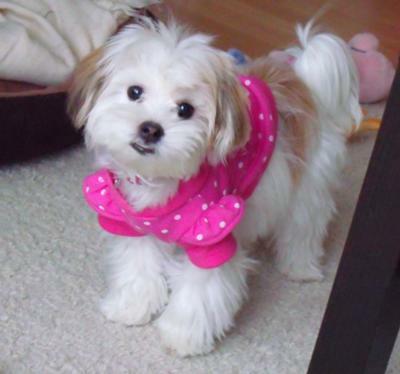 Bella is a very energetic and playful Lhasa Apso Maltese dog, she loves going for walks outside and chasing toys and balls. She loves people but can chase after them quite quickly. Bella is a very well-mannered and peaceful dog. She absolutely loves toys, treats, people, paper and exploring. Although she steals everyone's socks and will lick you as much as she can. We love family and are so glad we got her. Beebee is my Queen Bee female Lhatese. She is my fluffy little white dust mop with a touch of brown on her ears. She enjoys sun bathing, barking at strangers from our front door or window, taking car drives, riding in her special seat on the back of my bicycle, watching cartoons, pouncing at the TV if she sees another animal, keeping my English Bulldog, Chocolate Lab and husband in line, playing with her squeaky toys, and giving me lots of kisses. She will be having her 6th birthday on May 27th. I have never had a pet show such lotalty and companionship as her. She truly has a personality like no other animal I've ever owned. She is my little shadow. She follows me everywhere and really blows a fuse if I leave her behind in another room. She will bark at me and give me attitude like no other! She has been the best present ever. I am very thankful to have her in my life! My Lhatese dog, Bear was adopted at 8 years of age when his prior owner had a baby. Bear grew jealous of the baby because he was the baby for eight years. When he nipped at the child after the child kept pulling on his collar, the owner gave him up. The first week that I owned Bear he was snarly, did not want to be picked up, would have a major attitude, and was very sad. After patience, motivational training with lots of treats, I was able to do things with Bear that he never allowed during the first two weeks. Bear allowed me to wash his face. He allowed me to pick him up and and put on his harness to go for walks. Slowly, the attitude started to change, and the kisses began. 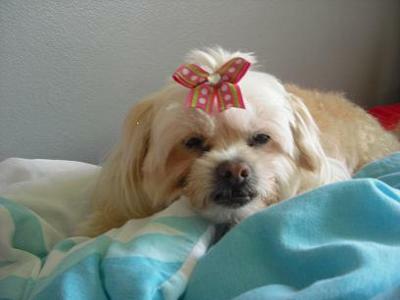 My Maltese Lhasa mix began to trust me explicitly. The only problem with Bear is he had separation anxiety when he is alone in the house. He will scratch on the door molding for hours exhausting himself. I adopted a rescue from a high kill shelter which calmed him for a bit, but only for about an hour. After an hour, he goes back to the door scratching away. We are still working on a solution. Regardless, of all that, he is the best boy. He is silly, and does funny things after he finishes a meal. He rolls on his back sliding across the hardwood floors with a ball in his mouth. He enjoys his walks. He loves the doggie park and playing with other dogs. He enjoys people and chew bones. He also likes his little sister sometimes when she is not jumping on him. 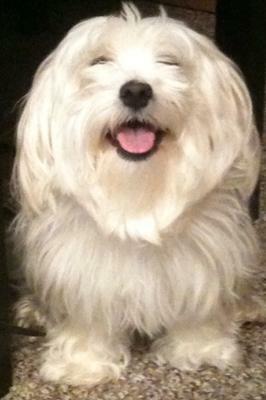 She is another Maltese. She is very sweet and in her shy little way, calms Bear down for a little while. My little male Lhatese is my world. His personality outshines any other dogs I have met. He likes to tell us about it in his little half barks and howls. He LOVES to bathe in the sun. He also is very protective of me. If someone enters my bedroom after I have went to sleep he sure makes sure that I know as well as the person entering the room that he is there with a high pitched barking to alert me. 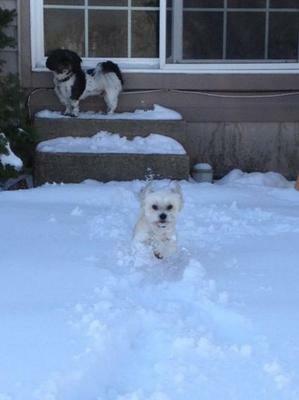 Even in the snow no matter how deep or how much he doesn't like it. He tries his very best to get to me. My children adore him also. They feel so much love from him even if it is second best to his mama. When mom leaves the house it is my oldest daughter he goes and lays with. If she isn't here then its my youngest son he lays with. But once mom is back the kids are second again. He is the most loveable lap dog ever! When I first got him. I tried to do the crate training with him. But he wasn't having it. Especially at night he would absolutely go crazy in the crate. So the first night he already had my heart. SO I gave him a chance and let him sleep in my bed with me. And not one accident, so needless to say he has been sleeping with me every since. And never have had an accident in the house... WELL except in the bath tub. For some reason ( which I'm very happy about) if he just cant hold it or didn't go outside before bedtime or had a upset tummy. He will hop into the tub and make a mess. Glad for that and also glad for bleach. When I ever do get another dog it differently will be another Lhatese.